Happy Black Friday! I hope you had a wonderful and very happy Thanksgiving! To celebrate Black Friday let’s have a GIVEAWAY! I am so excited to announce the release of Idiot’s Guides: Organizing Your Life by my dear friend Cyndy Aldred from The Creativity Exchange! I’m honored to have been asked by Cyndy to contribute to it too! 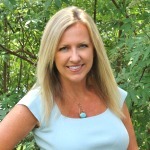 Every five years, Idiot’s Guide publishes an in-depth organizing book and Cyndy was asked to write their latest organizing book. 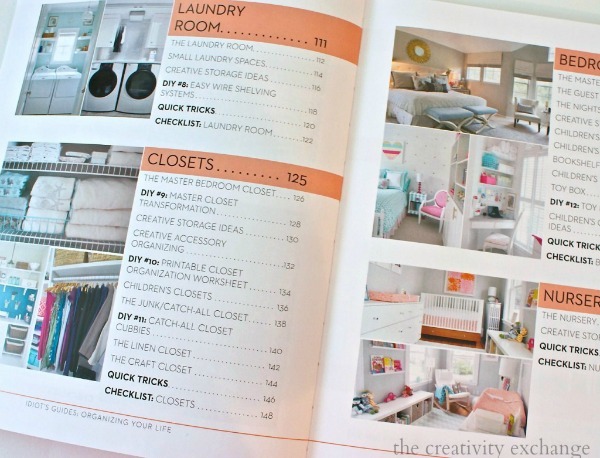 The book has 288 full-color (glossy) pages strategically designed to be more of a workbook with areas in each section for the reader to write in, take notes and create their own room by room checklist. You are able to use the book itself as a self-contained “plan of action”and serve as a workbook for systematically going through each area of your home. Do you notice the laundry room pictured above? 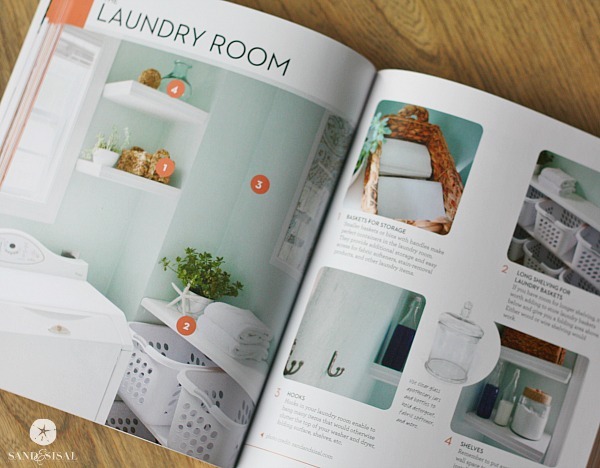 I was giddy to see my Coastal Laundry Room in a 4 page centerfold! After the introduction and the “Getting Started” first chapter, the book is broken down, room by room (kitchen, bedrooms, closets, etc..). 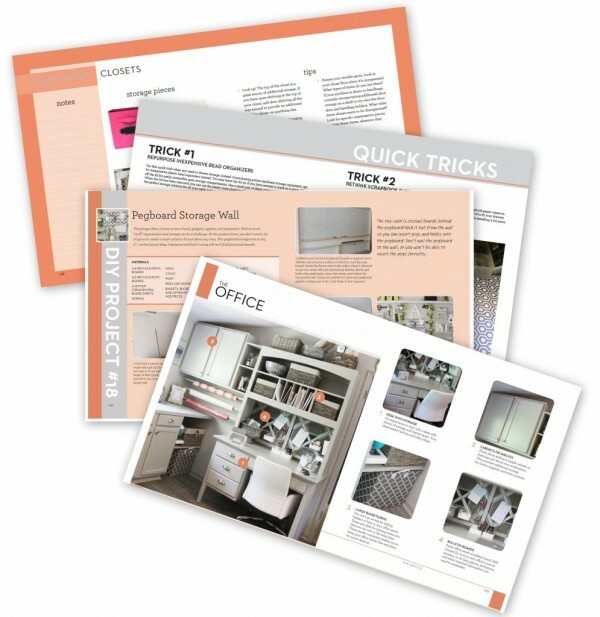 For every image shown, there are highlighted organization tips to the right that are examples in the featured image. At the end of each room section are two “Quick Tricks”, which are quick and inexpensive DIY projects for that particular room in the home. 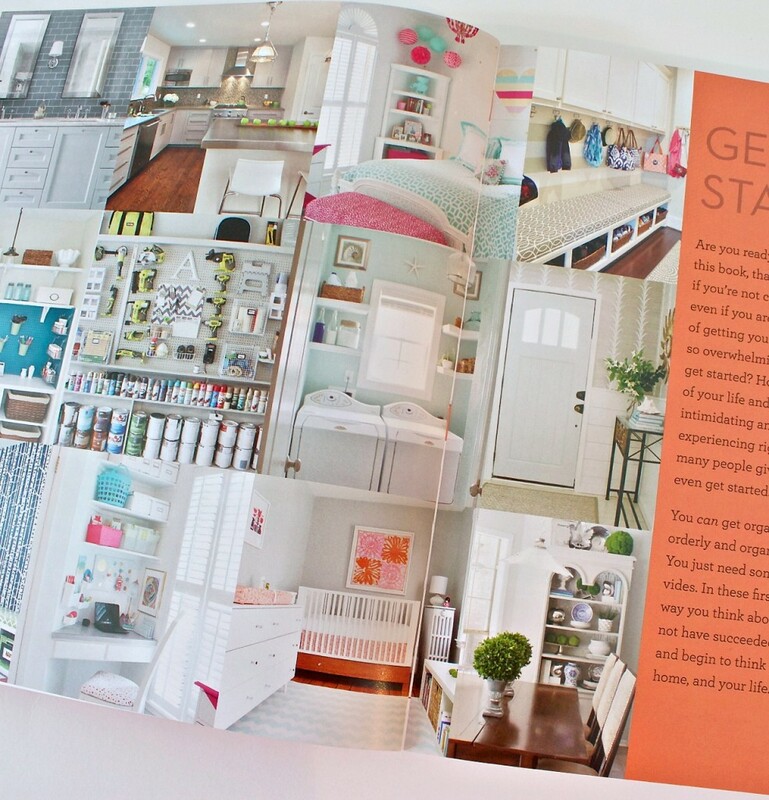 There are also 19 DIY projects throughout the book for almost every area of the home as well. There are more than 1500 images in the book that are great examples of creatively organizing/maximizing space. 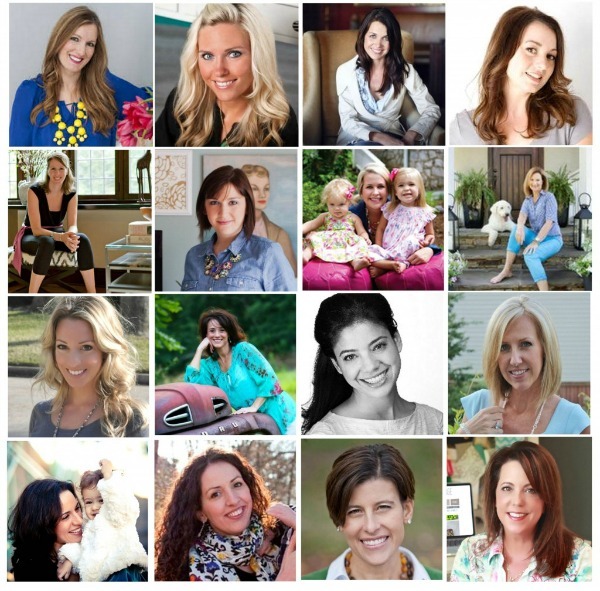 Most of the images are either from Cyndy’s home or homes of contributing bloggers and designers, all pictured below! I’m sure you will recognize many! 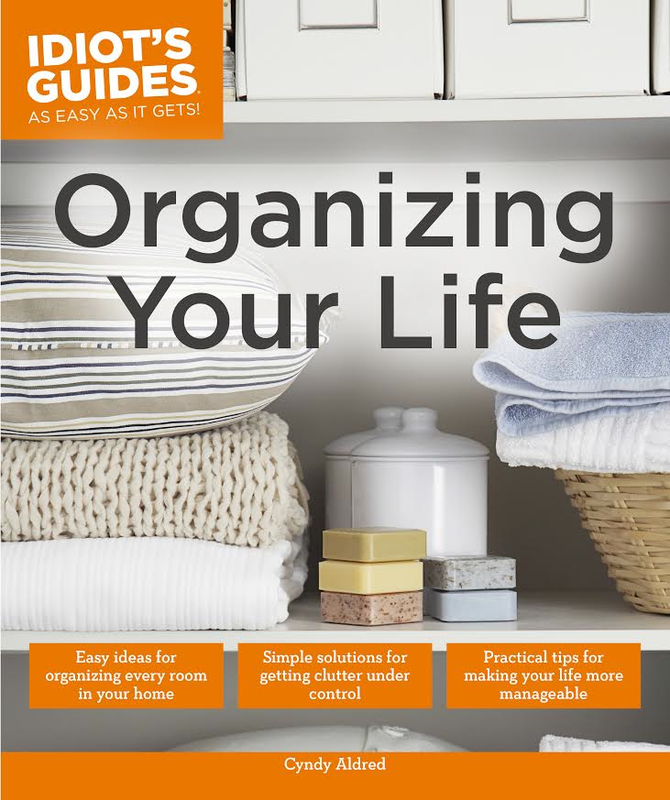 I’m giving away an Organizing Your Life book to 2 lucky readers, personalized and signed by Cyndy herself! She also has a beautiful “Live the Life You Love” custom print and tote for you also! Enter the Rafflecopter entry form below for a chance to win! It’s open to USA residents only. The book has been translated into multiple languages though and is available on any international Amazon site. My home needs organization in the storage room, master closet, pantry and a few other places! The book sounds great! How timely is this giveaway! With the new year just a few weeks away, I am inspired to get organized. Thanks. Oh my! My master closet!! My kitchen! it is tiny with tons packed into every inch! I too have been trying to downsize. My girls are both going to college and will be out of the house soon. I certainly have collected too much stuff and this would be great to help me sort through and organize! Oh how I would love this book. Thanks for the giveaway. Such a beautiful book to inspire the ongoing process of a neat and livable home! I’m a living nightmare! My whole is one huge mess. I hate clutter out on cabinets, etc. So I stash and dash. I can never find a thing when I need it. Arg……. I would love to win this book, I need so much help organizing my kitchen, especially pots and pan cabinets. The bedroom closet needs to be organized. Ny closets need the most organizing. I need help with my closets. They are bursting at the seams! My craft room needs the most help with organization. I have tried to organize it but I get frustrated and I give up! Which part doesn’t? Probably the WORST is my entryway closet, it is a clutter magnet! My kitchen! I just moved into a new rental and this new kitchen only has two drawers. Which part needs organizing? Let’s just say which part doesn’t need organizing! Thanks for the chance to win. O, my closet is utter mess, needs organization, this book will definitely help. I would like to organize my pantry. The craft room is on my priority list for organization. My basement – it’s a laundry, exercise, extra bedroom and sewing room…..
my studio/office is in the middle of a major overhaul…. any new ideas would be awesome! the book looks beautiful! What a great book!! I could truly use a whole house reorganization! I am half-way through with the kitchen!! Next up… kids’ closets! Our home office for sure! The book looks wonderful. I would love to win it! I need help organizing my whole house but probably my office/sewing room the most. Our garage needs the most organizing! I think the variety of ways we use it has led to corner “overflow”! My whole house. But my kitchen is my first priority. Every room in my home needs some organization but my husband’s home office needs it the most! The book looks great and I love all the beautiful pictures! As a pack rat, this book would definitely come in handy! Super giveaway!